The idea that the Internet has transformed business and created a global economy is an assertion that is often repeated in the media today. Yet there is little consideration given to the implications of the global supply chains for national futures. 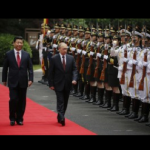 The echoes of the cold war could be heard this week as China and Russia announced their gas deal. Russian economic stress has been a theme that has appeared with increasing frequency in recent months . And then the gas deal – with its apparent economic benefits for Russia and its obvious geopolitical implications for everyone – was announced. Interestingly the announcement followed a military review, not always necessary in signing a trade deal. What was hard to miss as the Chinese and Russian leaders reviewed the troops (picture from the Washington Post) was the fact that the previous time this week that China had been front page news had come only a few days earlier when the US Attorney General, for the first time, threw down the gauntlet on Chinese industrial spying by indicting 5 hackers who were demonstrably focused on stealing US trade secrets. 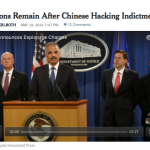 (Picture from the New York Times) The indictment went to some length to distinguish the crimes of the Chinese Army from the practices of the National Security Agency. And perhaps the media coverage of the indictments were in fact exploring one of the most newsworthy aspects of the matter. Were the two connected? Even if they went unnoticed in the minds of the Chinese leadership, its difficult to miss the point that it was the mini-war along the Chinese Russian Border in 1970 that led Ntixon and Kissinger to the sequence of events that resulted in Nixon’s “China Card”. The world today is obviously far more complicated. But another question raised by the indictments of the Chinese hackers was whether there might be a need for some rethinking of the global supply chains that have grown in the aftermath of the Internet. Today its customary for retailers in the heartland of the US to receive just in time delivery of their inventory by means of FedEx, UPS and other shipments to the US. The connections are intimate. They come from the massive shift of US productive capacity to China and other Asian locations. The economics of off shoring obviously did not include a calculation of the risk of disruption. There has been a 25 year bargain based on assumptions involving peace and prosperity. The events of the week may offer some new perspectives on those underlying assumptions.